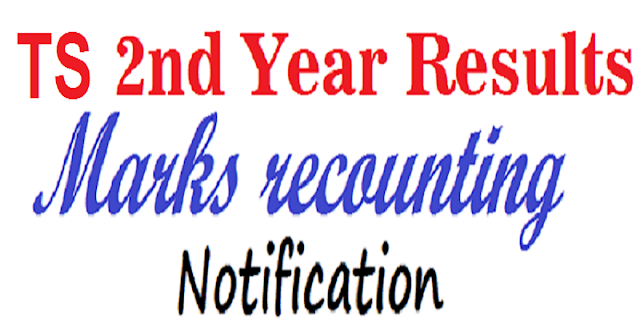 TS D.Ed 2nd Year 2019 Results Marks Recounting Application, dates 2019: The Director of Government Examinations has given press note for announcement of TS D.Ed 2nd year 2019 results and invites applications for recounting of TS D.Ed 2nd Year 2019 marks. D.Ed., II Year Examinations February, 2019 results would be released in March 2019 and Last date for applying for Recounting of marks is ..., 2019. DGE Telangana: The results or D.Ed., II Year Examinations February, 2019 will be released and hosted in website www.bsetelangana.gov.in on ....., 2019. The certificates will be dispatched to the Principals of the Institutions concerned in the State in due course. The Memorandums of Marks will be hosted in www.bsetelangana.gov.in Web Site for the convenience of the candidates / Colleges. The Candidates who want to apply for Recounting of marks In any subject have to apply to this office either directly or by post to the name address of Smt. M Padmavathi; Addi. Joint Secretary. Last date for applying for Recounting of marks is .....2019 With the following documents. Date's will not extended under any circumstances. (iv) A fee of Rs.500/- (Rupees Five Hundred) only per subject. Through a Government Challan to the following Head of Account.